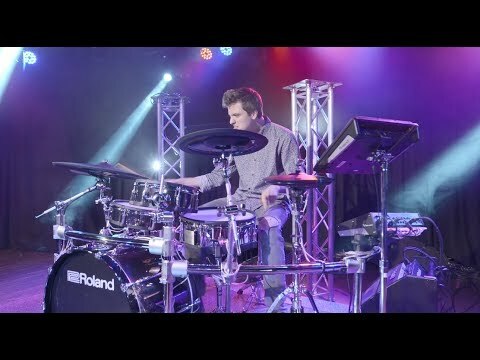 Roland V-Drums are kits that are synonymous with best-in-class digital percussion. The clarity they are capable of is nothing short of spectacular. To this end, you need a monitor system that can deliver not only excellent quality but also packs plenty of punch. Enter the Roland PM-200 Personal Drum Monitor. Sporting a 180-watt amplifier, custom 12-inch speaker, EQ, direct audio out and more, this is an absolute must for professional digital kit players. The PM-200 goes hand-in-hand with any V-Drums set. Its compact size and light weight are ideal for playing at home, and the powerful custom fitted speaker system delivers clear, full-range sound with impressive punch and presence. The face of the PM-200 is angled upwards for optimal sound monitoring whilst you're seated at your V-Drum kit and a full-width bar handle on top offers an easy way to carry and adjust positioning of the PM-200. Thanks to the integrated mixer, the PM-200 means you can monitor backing music and external devices whilst playing on your kit. There’s a dedicated V-Drums input, plus 1/4-inch and 1/8-inch line inputs for connecting electronic percussion pads, smartphones, and other music players. Each channel has independent volume controls and there’s also a two-band equalizer so that you can shape the sound to your liking. Although the Roland PM-200 is a mono monitor, its inputs support stereo sources. The direct audio output also means you can pass true stereo sound to an external mixer - ideal for recording or live mixing whilst maintaining your own monitor level. The direct out is controlled by a convenient rear-switch that changes from dual-mono to full stereo depending on your needs. The PM-200 packs in a massive 180 Watts of power making it ideal for stage and studio use, or even at home providing you have friendly neighbours! If you own a V-Drums kit or any other kind of digital percussion and you need high-fidelity audio combined with pro-level connectivity and incredible power, the Roland PM-200 is the best for you.